As far as the physiological adaptations of desert animals are concerned, the alterations of the appendages (ears, paws, tail) are important. 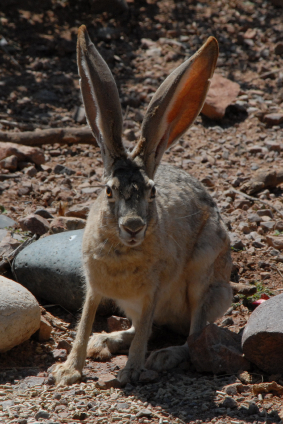 These appendages are very well developed and permeated by blood to be able to cool down more quickly, an example being the Jack rabbit or the hare of the Sonora Desert, in America, that just for this reason has much longer ears than the hares living in milder climates. Some animals can stay without drinking for long periods because they expel very concentrated urine or even crystallised uric acid such as some birds and reptiles. The “pyramid mouse” can instead trap the water lost through respiration by making it flow through a set route of twisted passages opening up in the nasal ducts: in this way, the air cools down and becomes less humid, and is therefore trapped inside the animal’s body.